Dj Catch was born in the UK in 1969. Hip Hop was in the blood from day one, as it is now. First vinyl bought was Electro Crucial in 1984, that got me into the B-Boy scene, using old motorbike boxes instead of lino (lino came later). Joined the Sidewinders B-Boy crew in 1985, had sponsorship which led to shows around the Essex area. Hand in hand came the graffiti scene, which led to bombing walls & trains (but we won't go into that). Then came the first decks and mixer in 1988, now I have moved on from the Maxell mix tapes to the digital age of CD. My debut album "Here Come Da Pain" was mixed and produced in my home studio in Essex over a three month period. The second follow up album is now complete & available to buy. Serial 187 contains tracks by Ice-T, N.W.A, Plan B, Snoop Dogg, Dr Dre & many more, the new album also contains samples from various movies based on the serial killer theme. Both albums contain adult content & are not suitable for minors ears. Here Come Da Pain & Serial 187 are both available exclusively on this website & Ebay. It can be purchased securely through PayPal on both sites. 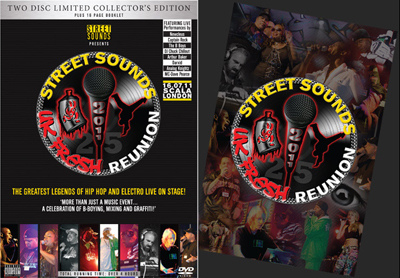 In 2011 I designed the logo for the Street Sounds UK Fresh Reunion Hip Hop event at Scala in London. 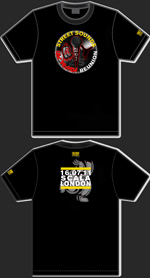 Aswell as helping with the design of the event T-shirt I also took alot of the photographs used in the DVD and booklet of the event. I am available for design or photography work, please email your requests, see contact page.